Novus’ FieldLogger is a versatile, powerful and cost-effective data-logger handling analog, digital and other types of variable with high resolution and speed. It is a high-performance and high-connectivity piece of equipment, which is easy to configure and operate. 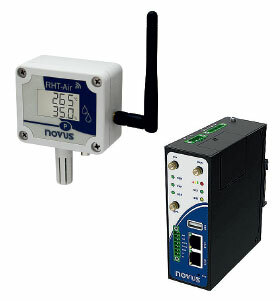 As it has multiple analog inputs, FieldLogger’s scope of operation is greatly increased when used with other equipment, such as HMI Remote Mounting Kit; the multifunctional wireless gateway AirGate Modbus; the RHT-Air wireless transmitter, which, when coupled with AirGate Modbus, provides an excellent solution for wireless monitoring of temperature and relative humidity variables; and the AirGate 3G which, when applied in M2M communication, enables a Modbus RTU network to be monitored by more than one master. Novus FieldLogger has eight configurable analog inputs that can read thermocouple, Pt100, Pt1000, voltage and current signals. It also has two relay outputs and eight digital ports individually configurable as inputs or outputs. The RS-485 interface can operate as a Modbus RTU master or slave. As a master, it can read and log up to 64 external channels. It also has a 10/100 Mbps Ethernet interface that allows access through a browser (HTTP), FTP (client and server), email sending (SMTP), SNMP and Modbus TCP. FieldLogger is equipped with one USB interface to be connected to a computer for configuration monitoring and data download. The other USB port is for plugging a flash driver for data retrieval. The 512 Kbit logging memory is used to store data and this can be expanded via an SD card.